Remember the telltale “Doll’s Head” look of hair transplants? Well, you can forget about it! 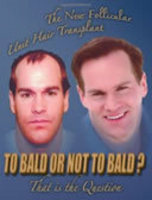 As world renowned hair restoration surgeon, Dr. Shelly Friedman, explains in his new book: To Bald or Not to Bald? That Is The Question! Dr. Friedman’s book is now available for purchase on amazon.com. Remember the telltale “Doll’s Head” look of hair transplants? Well, you can forget about it! As world renowned hair restoration surgeon, Dr. Shelly Friedman, explains in his new book: To Bald or Not to Bald? That Is The Question! (MWP Media, 2010), his refinement of a relatively new technique - follicular unit hair transplantation, results in a natural looking head of hair in just one procedure. Dr. Friedman’s book is now available for purchase on amazon.com. Using custom cut micro surgical blades, Dr. Friedman extracts hairs in their naturally occurring one, two, three, and four hair follicular units from areas of the scalp that are programmed to resist balding. He transplants them into tiny incisions in the balding areas measuring just .65 mm in diameter. For comparison, older methods of hair transplantation required incisions of a 3 to 4 mm. diameter. By extracting and placing hairs the same way they naturally grow, in densities of 50 to 60 hairs in a square centimeter, Dr. Friedman achieves a look that’s completely natural and undetectable. Finally, men and women experiencing hair loss are able to come into a doctor’s office and emerge with their hair and their self esteem restored. For more information about Dr. Shelly Friedman, visit his website: http://www.scottsdaleinstitute.net or for any media relation questions, please contact Aaron Feldman, at aaron(at)medicalpracticespecialits(dot)com.